This morning's tragic events at a Pittsburgh-area high school unfolded on social media with condolences, rumors and photos. This morning, a high school student wounded 20 people at a Pittsburgh-area school when he went on a stabbing rampage. 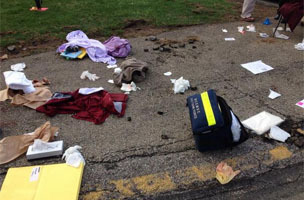 According to NBC News, the 16-year-old hurt at least 19 other students and a school security guard. The suspect is in now in custody. Selfies are, at their core, an extremely effective way to prove that we humans exist. They don’t just validate us, individually; they validate our lives, collectively. Selfie, therefore we are. It’s the photographic equivalent of the “Whew! We made it!” that emerges after a scary airplane descent and then a safe landing. If you buy that theory, then the Instagram above—a classic mirror selfie, shot and posted to Instagram this morning—is its apotheosis. The stabbing apparently occurred around 7:10 (not entirely sure) and ended very quickly (contrary to some news reports of it lasting 30 minutes). Since this was before class started, the hallways were crowded with kids at their lockers getting ready for class so there were likely a hundred people within the vicinity of the attacker. One kid who was stabbed pulled the fire alarm and people were able to escape onto the football field. There were teachers telling drivers to turn around too, but I pulled around and parked in the sub lot and saw everyone on the football field. We were then ushered into the middle school and that’s where we stayed until our parents picked us up. My sophomore year English teacher had the possible stabber in his class and described him as quiet, but he always did his homework. He made at least two phone calls last night to people saying he was going to mess up the school the next day. Both calls were from a restricted number. One of the kids tweeted his call log which had the restricted call, but deleted it not soon after.